One of our universal laws is that everything vibrates. Nothing rests. Everything moves at one frequency or another. Even looking at cells at a subatomic level, we can see that it is moving, vibrating energy. Everything is pure energy. We see ourselves different from everything around us, even separate from the things around us. But we are not. We are all the same, made up of energy. It is just that everything vibrates at different frequencies and it appears different in different forms. We are not separate from the trees or the animals, tables, houses, flowers or even other people. We are all the same and all connected by the universal cosmic energy of the universe. If you recognize yourself as separate from everything then you have no power – you are disconnected from all that is. But if you can see that we are all part of the same then you have the power of the cosmic universe, the life force of the whole universe flowing through you. Making us a growing consciousness, where we are expanding and evolving. As you all know, our bodies are energy. Our body works using electrical energy. All cells in our body store and emit electricity. It uses this energy to move, digest, to work our muscles and organs. Our body also has electromagnetic fields. These include, Meridians (body energy pathways), Chakras (body energy centres) and Aura (energy atmosphere). Our energy flow affects how we feel, how we think, and our health. But when our body’s life force is blocked, an imbalance can occur. If not addressed it can form as a physical illness. Our body uses electromagnetic impulses energy when we have thoughts, emotions and feelings. This then means that even our thoughts have a measured amount of energy. Going back to the understanding that everything is energy. It penetrates all form and space. Our thoughts create our reality. Understanding this allows us to have so much control over our lives. If thought is energy and energy is vibration than that means that we can choose to vibrate a higher or lower frequency. The higher the frequency the closer we come to living as our true selves. Remember when you channel your energy with your mind or your body you are the energy of the total universe and therefore you have the power of the total universe within you. How do I visualize something I cannot see? Think of energy as a water droplet dropping into the ocean. It causes a ripple effect and the energy of the motion moves out through the water. See the water moving to accommodate this burst of energy. Now imagine your words or thoughts doing the same … rippling out into the universe … towards another person. That thought is now energy and the universe accommodates it. It cannot determine if it is good or bad, it just is. But when this energy hits something that does not have the same frequency then it can cause a block as the energy can be trapped. Viewed under a microscope, you can visualize how much power you have? You can use your created energy to affect everything around you. 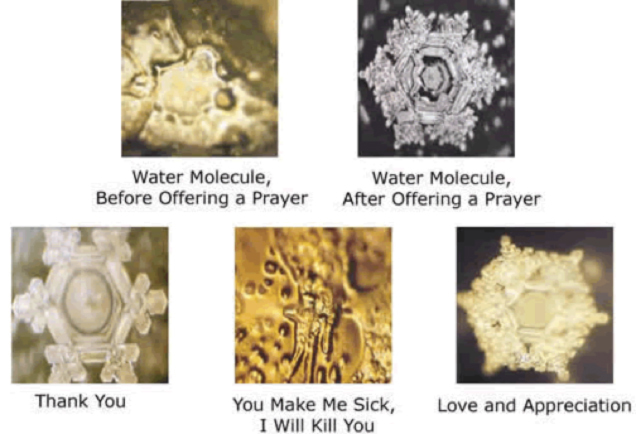 For a visual example, here is a picture of the affects of words on water crystals.